I bought fresh ginger this week to make stir fry, so yes, this is my third ginger recipe this week! When I make a new recipe, I often just open the fridge and see what needs to be used up. This was one of those. I was a little bit lazy this time and didn't bother grating the carrots and chopping the ginger, I just threw them both in the food processor, so you can use either method. Preheat oven to 375 degrees F. Grease a muffin tin with canola spray or line with muffin papers. Pour oats into food processor and grind into a flour. Pour oats into a large mixing bowl. Chop or food process carrots and ginger. Set aside. Add flour, salt, baking soda, baking powder and spices to mixing bowl with oat flour. Stir to combine ingredients. Add fresh ginger and carrots from food processor to mixing bowl. Add maple syrup, egg, coconut oil, and coconut milk and mix until uniform. 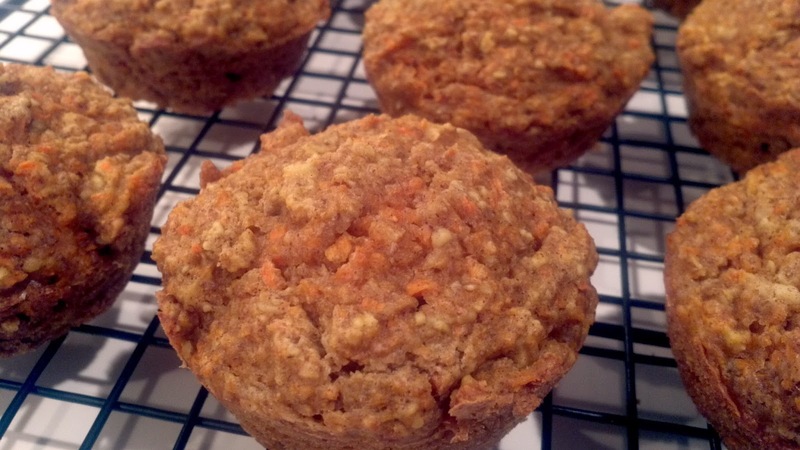 Scoop batter evenly into muffin tins and bake for 18 to 20 minutes, until muffin tops are firm.